I’ve just boarded my flight and the typical sequence of events begins to unfold. We file into our seats, the doors close, and our flight attendant checks the aisles. She begins reciting the usual instructions, and I start to tune out the excess noise. However, she begins with humor, joking about how she’ll be sharing information we may have heard before, yet are definitely going to be listening this time… Right?! She has a spirited joy and I immediately perk up and pay attention. I look around and many of us are smiling and watching her go through the demonstration. She could follow the script given to her word for word and be average like the majority of everyone else. But, she is choosing something different. She is choosing to be extraordinary. She brings her own unique flavor and delights the heck out of everyone, including herself! Not only that, but her work is better. Her message is reaching us. The customers are experiencing more enjoyment. And, actually fostering a connection because it starts a conversation. In what other ways can we add our own twist to the everyday routines and experience more joy, connection, and success? Curious, what’s one way that you’d choose something out of the ordinary instead of the typical script? Share with us in the comments below! A great attitude to keep in mind when we do routine things and choosing to bring something of ourselves to it and sharing it so others will enjoy it as much as you do. This is very small but in my internal emails to my colleagues (versus clients), I try to be really upbeat and always wishing them a happy-something. “Merry Monday to y’all” or “Happy Aloha Friday” or some sort. I’ve gotten some great feedback and even my boss says she always smiles when she reads my emails. I guess I manage to make it look convincing and peppy even if I secretly feel really sh1tty. Hi Christina! 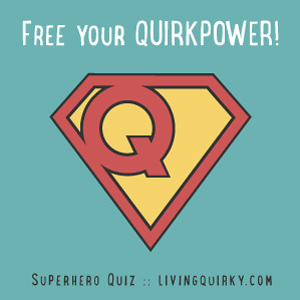 I wanted to thankyou some more for your fantastic PDF’s from the Quirk Nation! I loved this most recent one about reframing (awareness + mindset) creativity so we enjoy each creative act not just our “ARHHHT” work. The 3 things lists of what we will do differently, was right on time for me. Great for all the days of being in a creative void, waiting for inspiration, wishing we had a project to work on. I could learn to savor what I already have! Getting so caught up in wanting more more more creativity robs me of the pleasure of what I’ve made. It IS all about awareness and mindset! I just had the opportunity to show some of my work to visitors at my house; that is satisfaction enough for today! It felt like they were getting ideas by the moment for their own projects. What could be better than that! Thankyou for sharing your fabulous creativity with us and giving us the nudge to keep on keeping on. This is my first time on this site. Very interesting, I love the concept. I am the Flight Attendant that was written about and just wanted to say THANK YOU!! I love my job and it warms my heart that you appreciated your experience on my flight!